Allergy-Free and Easy Cooking: Giveaway Time! I have the perfect treat for you all, my lovely Allergy-Free friends! There is a new book out that will prove to make your meal times in your Allergy-Free Kitchen a breeze. 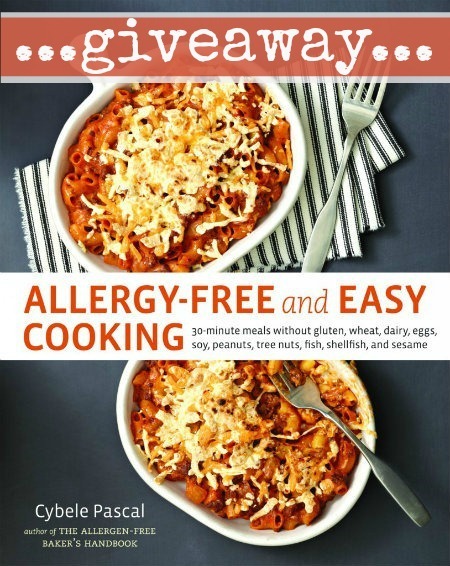 Cybele Pascal – The Allergy Friendly Cook – has recently released her newest cookbook: Allergy-Free and EASY Cooking: 30-minute meals without gluten, wheat, dairy, eggs, soy, peanuts, tree nuts, fish, shellfish, and sesame. This baby is a goldmine of simple meals that everyone in the family will love and yet not even realize are also Allergy-Friendly! I actually spent much of the holidays cooking from her book because I was wanting something quick, healthy, and simple to get on the table while we were busy with all of our holiday fun. Every recipe we tried was a huge hit in this house. I love how she begins the book with a 13-page guide to stocking your kitchen for your Allergy-Free Cooking. There are some great tips for everyone, whether you are just getting started on your food allergy journey or even if you have been traveling this road for a while. And because I know how perfect this book is for all of you, I am giving away a copy to one lucky person here. UPDATE: THIS GIVEAWAY IS NOW CLOSED AND THE WINNER HAS BEEN NOTIFIED BY EMAIL! To enter to win a copy of Allergy-Free and Easy Cooking, by Cybele Pascal, just simply do One, Two, or all Three of the following. Just leave A SEPARATE COMMENT for each one that you do so that you can earn an entry for each. 1. Tell me what intrigues you about this cookbook! 2. Follow Cook It Allergy Free and/or Cybele Pascal on Facebook, or tell me if you already do. 3. Share this post with your friends on Pinterest, Twitter, Facebook or other social media and leave an additional comment saying you did so. Help spread the word about this great new cookbook! The contest will end on Wednesday, January 16th at 9.am PST. The winners will be announced then. You must be at least 18 years old to enter. If I don’t win it I’m going to buy it. I’m always taking recipes and modifying them to be wheat, dairy, egg, and peanut free. It’ll be nice to just follow the recipe for a change. I follow both of you on Facebook. I pinned this on Pinterest. I love this quick and easy nature of this cookbook! I’m always short on time, so 30 minutes or less is intriguing! I follow you and Cybele on Facebook. 3) I shared this on facebook. I pinned this on my giveaway board on Pinterest! I love the “fast” part of this. I have several chronic pain illnesses so I can’t spend a lot of time standing in my kitchen. Having to eat gluten-free, dairy-free and soy-free really complicates things so I’m always looking for short recipes and shortcuts! OK, shared your Facebook post! I already follow both you and Cybele on FB. What intrigues me about this book other than I’ve already purchased one for my niece but not myself? There are recipes in which you can buy a lot of premade items that significantly reduce your time in the kitchen as well as recipes for homemade sauces and some really lovely meals. She covers so much in space. 1. I recently found out I have sensitivities (not allergies) to wheat, eggs, soy, dairy & yeast. I would love to have a cookbook with new ideas/recipes to avoid my food sensitivities. 2. I was following Cook It Allergy Free and am now following Cybele Pascal. 3. I shared this post on FaceBook & Pinterest (I’m not on Twitter). What a great book to have! This would be so awesome because I have Celiac and my oldest son is severely allergic to tree nuts and coconut so we’re always looking for great allergen-free recipes that we can both enjoy!!! Following Cook it Allergy Free on FB and LOVE LOVE LOVE it! I am following both on Facebook and I will repost this post… Always love new ideas for great food! I already liked YOU on Fb and just liked Cybele Pascal. What intrigues me about this book is the combo of allergy-free and EASY! I generally cook without all those allergens and am always on the lookout for new, easy recipes. I am always looking for new recipes to make that my family can eat–it’s too easy to get stuck in the rut of making the same sorts of food all the time. This cookbook looks really interesting! I follow Cook It Allergy Free on facebook. I am so excited about this book because I can not have gluten, soy, dairy or eggs and my daughter has dairy/soy allergies. My son also has peanut/nut allergies. As you can see I am always in need of new and easy recipes for my family to enjoy together. Sometimes I end up cooking two different meals. It’s nice to have something we all can eat together besides the basics! I follow you on Facebook. With a child with allergies, this cookbook would be a great asset. I need all the help I can get adding gluten free variety to my routine. It would be great to open a cookbook and just try something new. I love the family friendly aspect — I want to start cooking meals my toddlers will eat! I follow Cybele Pascal on Facebook. I already have Cook IT allergy free and Cybel on Facebook. Would love this book for fast and easy recipes. Would benefit our family as we have sooo many food intolerance. I’m intrigued to see a vegan section and glad that multiple allergies are covered like wheat and dairy. My new favorite cookbook also eliminates all the major allergens and is also vegan throughout, which I love (no soy substitutes, just real food that makes everybody happy). I think it’s called “The Welcoming Kitchen” and I have turned down almost every page to try the recipes. 🙂 Just recommending it for any other vegetarians out there who eat GF, DF and SF. I follow you on Facebook. I would love some new easy recipes that my whole family will love. It is so frustrating to make multiple meals for my DS with dairy, egg, and peanut allergies. I would love recipes that are good and allergy friendly as most of my family has allergies/sensitivities that make it difficult to cook for family functions. I follow Cook it Allergy Free on Facebook and have the app on my iPad and I love it! My 6 year old daughter has senstitivities to wheat, whey (dairy) and sugar so cooking, although healthy previously, has become a whole new challenge for an already fussy child! I’ve used some of the recipes from Cook it Allergy Free and so far, so good!!! I’m really looking forward to the casserole section! There’s been so many times when I’ve just wanted to make broccoli casserole or lasagna. We’ve been making taco pies for the last few months, and really need something different! My wonderful boyfriend cooks most of our meals because I get home later than him. I would love a cookbook full of quick meals so I could take some of the burden off of him. I’d love some recipes my whole family can enjoy! I like the idea of the meals taking less than 30 minutes… that is what I find the hardest part about cooking allergy free… I miss my quick meals! Following Cook it Allergy Free on Facebook! I pinned it on Pinterest. This cookbook intrigues me because I love cooking so much and am always looking for recipes that cater to my dietary needs. Now that I don’t have my mom around to help me, it is important for me to be able to do it on my own. Finally a book that excludes nuts!! I have purchased several but they always use nut products which my soon can’t have. I follow you and have shared on Facebook!! This cookbook has captured my attention because a) it looks beautiful, b) more options for our restrictive diet is always welcome, and c) 30 minutes or less … SOLD. Like Cybele Pascal on FB. Looking forward to new recipes. Hoping some of them are corn free as well as gluten free. I follow Cybele on Facebook. I’d love to win. I’m always on the lookout for new gluten free cookbooks! Main thing that intrigues me is the word “EASY”. Being new to gluten/dairy free cooking, I am looking for anything “easy”! Thank you for this opportunity! And have shared on my facebook page, so any friends or family of mine with allergies may get the benefits offered on your page. The cover of the cookbook is lovely. Always looking for allergy free recipes , due to celiac and multiple allergies. I love Cybele, and would love to own this book too! Her baking book was so helpful in the beginning! I follow you both on fb, email already! I really appreciate the effort required to produce cookbooks like this. It is always welcome to see new and up to date recipes. I’m following Cybele Pascal on Facebook! The cookbook intrigues me because I am a life-long vegetarian who is interested in cutting back on dairy and gluten as well. I am intrigued by the fact that it’s allergy free, EASY and something EVERYONE will love! That hasn’t happened for me yet! I already follow Cybele’s FB page and I am now following Cook it Allergy Free’s page! I always love finding new allergy free recipes. I will be looking forward the “Easy” recipes. I am intrigued by the book because the recipes are quick, healthy and gluten free. Thank you for the giveaway. I would love to own a copy of this book. I find it hard to find new recipes for my 4 children and am excited about the ones I have seen from this book! I am very interested in your book as I’m having a hard time finding good resources that combine wheat-free, gluten-free and dairy-free. I’m trying to get healthier and after 40, that’s really hard to do when you’ve got years of doing things a certain way engraved in your brain! But, I’m working hard and appreciate any resources available to me. I already follow Like on Facebook, and I shared it! I follow Cybele’s blog and I have her first book. A lot of gluten free recipes are not quick or easy, so the fact that the recipes are good and save time, is delightful. I am always in a rush to get dinner on the table, and this book would make life easier. I am interested because I already have one of Cybele’s baking books. I follow her on Facebook, and YOU now. I would LOVE to have a allergy free cookbook! Sometimes it is too tiring to adapt each recipe you want to use and it doesn’t always work out the best. I have Cybele’s first book and would love to see her new recipes! I’ve been wanting this book for a while, I love that it has a lot of savory dishes in it! Thanks for the giveaway! I am intrigued by the allergy free pasta…that sounds perfect! Thanks for the opportunity! I shared on facebook about the giveaway. Thank you! Everything about this book appeals to me it sounds like a goldmine. I all ready follow Cook It Allergy Free on Facebook. I am learning to cook allergy free and every resource is appreciated. And I pinned you to my Pinterest board. Yay! I pinned the give away & shared it! Always excited to get new recipes, especially healthy ones! My husband and I are new to eating gluten/allergy free. I am desperate for recipes. He has lost 45 pounds in four months. I love the idea of recipes that take 30 minutes because I get home from work at 6:30 and that leaves us eating dinner at 8! I already follow Cook It Allergy Free on facebook. I liked Cybele Pascal’s page. Done: Pinned, Tweeted, and Facebooked! The trifecta of social media. I hsve other gluten free cookbooks, but would love to make my life a little less stressful by having meals I can cook in thirty minutes. Allergy-friendly cooking always seems so much more complicated than regular cooking. For me and my boyfriend. This book would be a great one to throw in the mix so he can also see that it doesn’t have to be so stressful & can be easy! I am truy intrigued. I think to cook without all of the allergy causing ingredients is quite a challenge, especially when you are cooking for family. Recipes gotta be do-able and TASTY. Hope I win so that I can test drive the recipes and then recommend to clients that I do health coaching with. I started following Cybele on Facebook. I love Cybele’s last book and I recommend it more often than any other for folks new to restrictive diets. I can’t wait to see what she comes up with for meals. I could use some new ideas for make ahead and freeze options. I follow “Cook it Allergy Free” and have for a while…. Looks like a lot of recipes included. Love that. Also love the gluten free products and online stores are listed. I’m am very kitchen challenged. I love that this cookbook says that it’s allergy friendly for everything we’re looking to avoid or have to avoid! I’m dying to find out how tasty the recipes are!! I’m soooo excited about this cookbook! I’ve been following Cybele for years! Her “Allergen-Free Baker’s Handbook” is a necessity in my kitchen, we couldn’t live without it! My biggest challenge is feeding our whole family and only cooking one meal, I know Cybele’s new cookbook will help me accomplish this goal! I “like” and follow you on Facebook and posted about this great giveaway! I would be beyond thankful if I won your book. Thank you! What intrigues me? More Cybele Pascal recipes – I love her baking cookbook! I want more! I am a 21 year old college student who already has a picky palate, I have never been a fan of meat limiting myself to chicken, fish, and mostly dairy with a few veggies and fruits. I have just aquired allergies for the first time in my life and let me tell you it seems like the end of my world. I am trying to adjust to my new allergy to all dairy, rice, and chocolate which just about sums up my entire diet. I am on day 3 of my new life with allergies an it is seriously depressing. Crazy to go from eatting a food your entire life and waking up the next day being told that food can kill you!! My adjustment has been very difficult and I only expect it to get worse with my school semester about to start up full blast leaving me with little time to cook or search for recepies in which I can eat. I would love to have your cookbook to help me get through this rough time and to hopefully see a bright side to this new found allergy life, something I consider absolutely awful. Repinned Cook It Allergy Free for quick easy reference!! We have many different allergy issues in my family. This would be great for adding some new things to our menu. I’m intrigued by the new recipes that I’m sure are going to knock my socks off! I love her creations. I’m a Facebook fan of you both already. Thanks! I liked you on Facebook and shared the post as well. This is a recently new journey for me and I am enjoying your blog. My son and I do not eat gluten or dairy, but I need to feed my younger son and husband too. These look like meals the whole family will enjoy, and I am looking forward to casseroles! I’m intrigued by gluten and dairy free recipes. Would love to try the recipes from this cookbook. liked your facebook site.. I love cookbooks. I would love a copy of this cookbook because I cook for my food allergic family every day and I am so interested in recipes that are quick and easy. I am intrigued by how many allergens this cookbook takes out! I follow Cook it on FB. You had me at quick and easy and recipes the whole family could enjoy. I also like that their are vegan recipes since I am now trying to cut dairy out as well. Thanks for the chance to win this. Posted to FB & twitter…. I love all things dairy free, since my daughter was born with milk protein allergy that causes anaphylaxis. I’m intrigued to see what kind of meals I can create that will appeal to my picky husband that will still be milk free. I’m tired of having to make more than meal at supper time to keep them both happy and healthy. I have one child with food allergies in the family as well as one member who has chosen a vegan lifestyle….I’m intrigued by the vast amount of choices that would meet both of those needs in our household without having to make multiple meals! And I follow you on Facebook! This will be a perfect one for my 9 yr old son allergic to all the allergens listed including shell fish. I follow CookitAllergyfreee by email and the iphone app. Carol amazes me that she creates so many recipes with none of the major 8 allergens. I love cookbooks! I need this one because I have so many allergies and this one looks like it covers all of them–and MORE! I have 4 children who all have different food allergies and I have gluten intolerance so meals have been difficult. My dream is to have meals that the entire family could eat and enjoy. right now I make several different meals to fit each family members needs. Would like to no longer feel overwhelmed and have more time with my family. I followed you on facebook. I am intrigued by how easy cooking allergy free could really be. I am always looking for more gluten free and healthy recipe options. I love hosting parties and events and it would be great have some new recipes ideas. It would be great to welcome my guests with some amazing, yummy and allergy free foods! I love new recipes that we can eat! The easy and 30 minutes intrigue me the most. I recently went on a non chosen ‘cleanse’ (i.e. I got sick for 3 days & couldn’t eat anything), weird part is I came out of it feeling better than ever. So I have not returned to dairy, wheat or coffee. BUT I cook for my family who are big carb & dairy lovers, so I feel challenged at every meal. Would LOVE to have an opportunity to learn some new fast, family friendly meals that we can all enjoy. I also pinned on pinterest. thx. My son has multiple food allergies and I really need some inspiration for meals to cook him. There are so many food allergies in my family that I’m intrigued that there is finally cookbooks out there for families like mine. From my dairy, citrus, gluten and shellfish intolerance, my daughter’s celiac disease, nut allergies, migraines, diabetes…. we have it all. When my children were growing up there weren’t many resources out there and I’ve done many things I shouldn’t have out of ignorance (such as giving my celiac daughter rye) I am so happy that there is so much more available information. I love that this books is allergy free <3 and easy of course 😛 which is intriguing. I have four of the allergies (wheat, dairy, eggs, peanuts) so I really need this book for Ideas! Oooh, “Takeout At Home” really sounds intriguing! I’m intrigued by this book because, while I am celiac and mostly have gluten free cooking figured out, my cousin has MCS and is allergic to wheat, dairy, and eggs. She was diagnosed only a few years ago. She’s very busy and sometimes too sick to cook. Her family eats gluten free. I sometimes like to make her meals for her and her family that taste close to the regular recipe. A cook book with quick recipes that are gluten free but also egg and dairy free would be ideal. And maybe I could teach her some recipes so she can cook for herself! Shared on facebook and liked CookIt Allergy free. I’m intrigued by the Take Out at Home section. I’d love to see the recipes! I follow your FB page. I like that it’s allergy free being we have different ones in our family and that these can be made quickly. I am thrilled that this cookbook avoids peanuts and tree nuts, since my son is anaphylactic to all including coconut and there are so many grain free recipes out there now that use these. Also, my son is anaphylactic to sesame so it’s nice to know I won’t come across those. My son and I also have multiple other food allergies so it’s nice to have a cookbook with savory, everyday recipes that I can make for my entire family to enjoy. I already followed Cybele on FB but I just liked Cook it allergy free on FB as well. It intrigues me that I can actually eat everything in the book!!! I am hoping to find more receipes to use with my daughter. I want a quick meal that EVERYONE can eat! Love it! I am intrigued by the wonderful comfort foods I’ve been trying to recreate myself (and not always very successfully) would now be at my fingertips. I have Cybele’s other two books so this would be a delightful addition. I would love to look at this book. Our family works around several food allergies and sensitivities. Cybele’s baking book is great, and I’d love to add this to my collection too. I follow both Cook It Allergy Free and Cybele Pascal on Facebook. I follow Cybele on FB! I am intrigued that there is a whole cookbook of food that everyone in my family can eat! I would really love to have this for my collection. My son is allergic to milk, soy and egg. I have Cybele’s first cookbook and have been wanting this one. The book intrigues me because I have been diagnosed with celiac disease and am always interested in new recipes/ideas. I already follow Cybele and I jusr “liked” your page, as well. It intrigues me how Cybele makes allergen-free food that looks oh so yummy! I am following Cybele on Facebook. Intrigue? Simply the fact that it’s got some wickedly yummy looking recipes that my family can try! It intrigues me that there are so many ways to make top 8 free QUICK & EASY!! I already followed Cybele, but now Nom Yum & Free follows you too! I shared your contest on Twitter! I am intrigued by the vegan options. My son is allergic to dairy and egg, so I would love to see her vegan options. I can always use another allergy-free cookbook – especially one by Cybele!! I follow Cybele on facebook! I”m following you on FB! I’m following Cybele on FB! I would love this cookbook…would love anything that can be done in 30 minutes. I posted this giveway on my Allergy Free Test Kitchen Facebook page! It intrigues me when you can take a recipe that everyone knows, i.e. mac and cheese or chocolate chip cookies, to make it allergy-free and tasty. I’m so glad I have found so many blogs and cookbooks out there to help me on this new cooking journey. I follow you on FB too! I’m intrigued to find out how to make gluten/dairy-free meals in 30 minutes! I liked Cook IT Allergy Free on Facebook! It intrigues me intrigues me the nowt because I’m having a hard time coming up with meatless dinners that my kids will eat. I also think that we don’t need to eat as much meat as we do. II’d love to win this. Thank you for the giveaway. This book intrigues me be because I can prepare everything in the book without worrying about whether or not I will have a reaction. I think you guys Rock! I have shared on Facebook. I am anxiously awaiting this cookbook! I have two sons with multiple food allergies, they only share one but have several separately. My youngest son, has a gluten allergy that is new to me. I am trying to find dinner options that we all will enjoy! My boys are getting very picky so I am desperately trying to find other options for us all. Thank you for the opportunity to receive this cookbook for free! What an amazing treat!!!! I follow Cybele on Facebook. Now I’ll follow you too. Got to and going to share this cookbook release on Pintrest and Facebook! I am looking for more ideas for meals that don’t take for ever to make. Great giveaway, thanks! I pinned this on Pintrest! I pinned it and liked on Facebook! I am intrigued because I have just learned that I have some food allergies and was afraid I would have a hard time adjusting… until now. I pinned this page to share with my friends. Hey! I am super intrigued by this cook book as I am relatively new to cooking allergy free. The family went gluten free and dairy free last spring. I have recently found that we migrate toward a few, safe recipes that don’t bother anyone! Would love some new ideas! I liked both on Facebook and pinned the giveaway! What intrigues me…I am a busy mum of a picky little boy with both gluten and casein sensitivities. I could REALLY use a new recipe book that would support me in making nutritious and delicious meals to ease our meal time struggles!!! I LIKE both pages on facebook! pinning and sharing on facebook for more chances to win!! FINGERS CROSSED!!! My housemate has recently gone allergy-free since discovering that her children were having all kinds of reactions whilst she is breastfeeding. She’s finding it pretty difficult, seeing as she has no allergies herself, and so I want to help her out with experimenting and trying out some new dishes we can all enjoy. Thanks for the site it’s a great resource!